According to World Semiconductor Trade Statistics, WSTS, semiconductor market growth gathered speed over the last year from a 7% decline in May 2016 to 21% growth in April 2017. 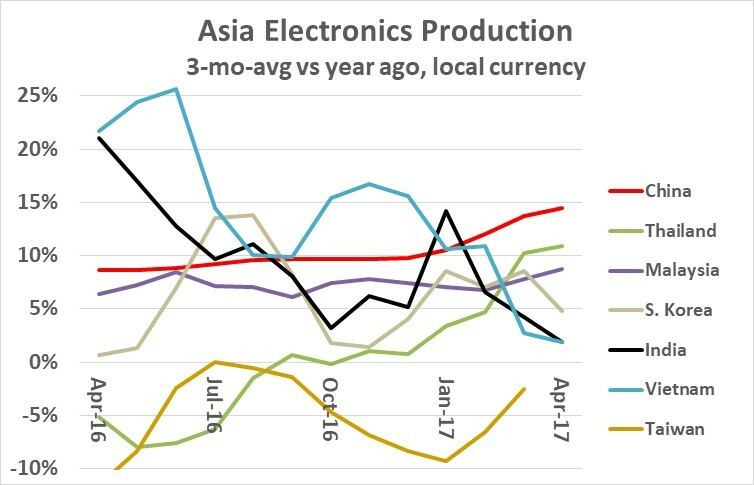 Electronics production growth in China moved from below 10% for most of 2016 to 14.5% in April 2017. China’s April growth rate is the highest in over five years. 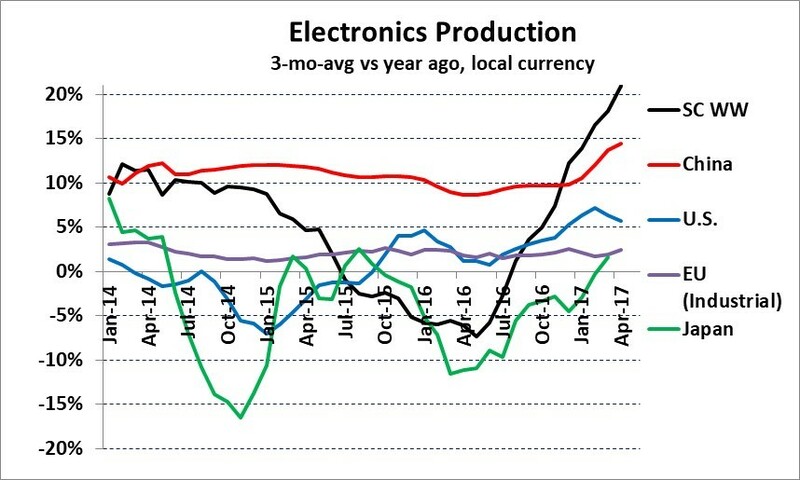 US electronics production growth has been over 5% since December 2016. 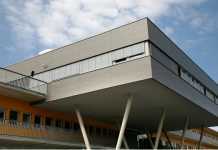 It had not been over 5% for over ten years, since November 2006. 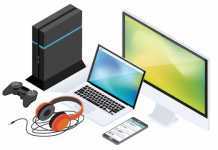 The EU no longer releases monthly data on electronics production. but total industrial production growth was 2.4% in April 2017. EU industrial production growth has been in the range of 1% to 3% since November 2013, following 20 months of decline in 2012 and 2013. Japanese electronics production growth has been volatile, with changes over the last seven years ranging from a 27% decline to 8% growth. March 2017 growth was 1.6%, the first positive change in the last 18 months. A China is the dominant Asian electronics producer. 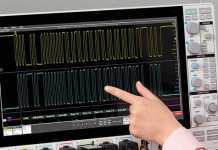 Vietnam and India are significant emerging electronics producers. However, over the last year, the growth for each country has decelerated from over 20% to about 2% in April 2017. Malaysia has shown steady growth in the 6% to 8% range. Thailand has bounced back from declines of 5% to 8% a year ago to double-digit growth in each of the last two months. South Korea has grown for the last 20 months after 12 months of decline in late 2014 to late 2015. 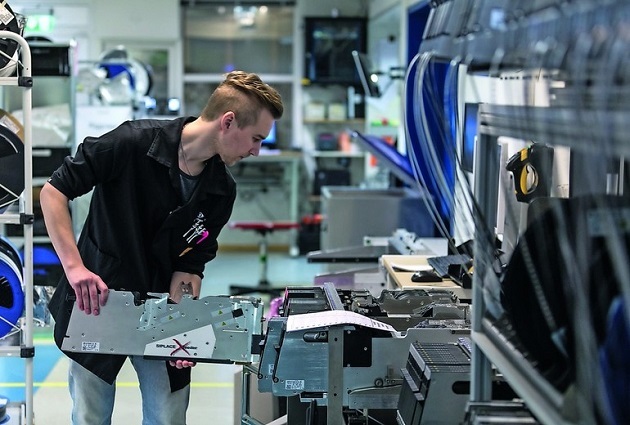 Taiwan has declined since April 2015, hit by the shift of electronics manufacturing to China. In many cases, it has been Taiwan-based companies behind the shifts. Taiwan is trending toward high cost at about $10 per hour. Location of electronics production is dependent on several factors, but compensation costs are a major consideration for labor-intensive, low-skilled manufacturing. The U.S., Euro Area, Japan and South Korea are high-cost areas with compensation costs over $20 per hour. 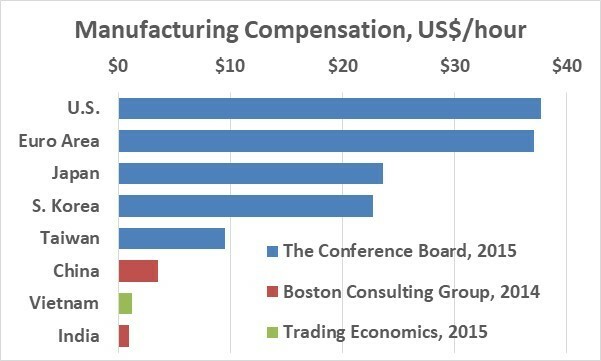 The table below shows average hourly manufacturing compensations costs (wages + benefits) by key countries. China at $3.52 per hour is low cost compared to the above countries. However, Vietnam and India at about $1 per hour have cost less than one-third of China’s. So India and Vietnam electronics manufacturing should grow faster than China over the next several years.